I fell in love with this ink instantly. The colour is close to my idea of the perfect green ink – medium dark with a streak of grey and a hint of moss. Not over saturated which gives it a translucency and shading that I simply adore when it comes to green. Since this was an unexpected gift, I had no particular expectations. I was, in fact, a little disappointed that it was a green ink in the package. I think it is hard to find a good green and thought it would be another OK-but-nothing-I-will-use-on-a-regularly-basis- green. One of the few exceptions from that fate is Montblanc British Racing green, but that is a dark, olive greyish green which I don’t really count as green (shame on me). 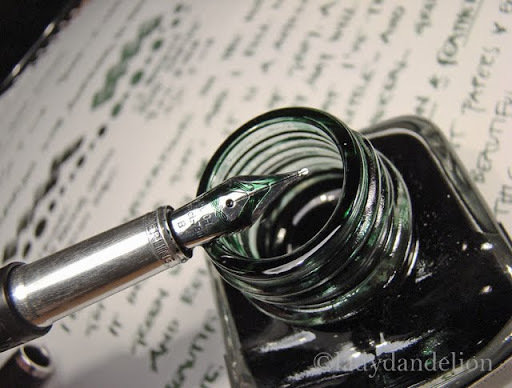 Even if I like the Diamine Emerald (featured in this post) I’ve felt that it lacked something – it is nice and was the closest to a favourite I had before this ink – but it is more a nice acquaintance than a real fave. 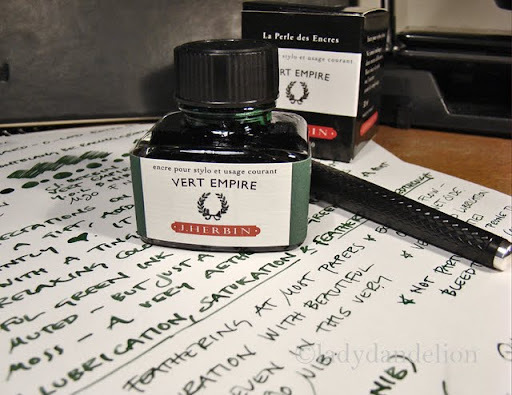 The Vert Empire was also bought by a fountain pen and ink illiterate, so I was touched by the thought, but – since this ink had never peaked my curiosity watching the Herbin colour charts – I had no reason to believe that it would be anything out of the ordinary. And – it turned out to be the most handsome green I’ve tried to this date (again I don’t count MB Racing Green since it isn’t a proper green). It manages to be both ethereal and dignified. 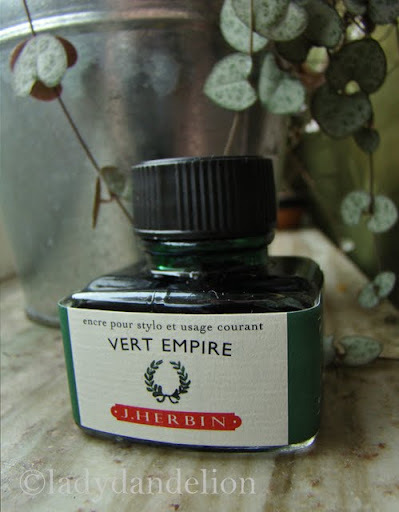 Colour aside: the Vert Empire is actually my very first J Herbin ink and if the other Herbins are this well behaved – excellent flow, delicious shading, almost no feathering or bleed through they will surely belong to one of my favourite brands. As I write there is actually three other Herbins on their way to me; the Red 1670 anniversary edition (link leads to Pensandco’s sample of this newly released ink) , the Poussière de Lune and Larme de Cassis and I look forward to try them out and hope that the postal system is efficient – despite the long Easter holiday. The names are truly poetic: Moon dust (Poussière de Lune) and the tears of the Cassis. The sample in the photos was written with a Yard-O-Led with a wet broad nib and A Pilot M90 with a fine nib to give a representative impression of it. The flow is really remarkable and it gets along very well with all pens I’ve used it in and seems quite easy to flush out properly. 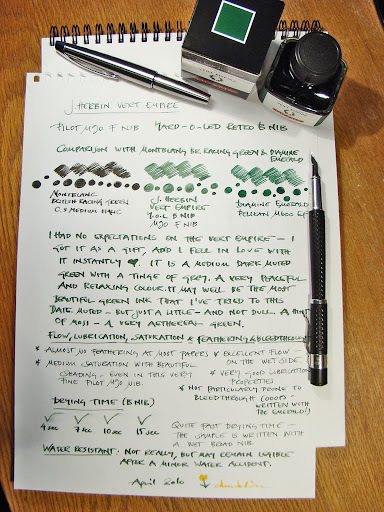 It dries relatively fast – especially considered that the nib used in the sample is a wet, luscious broad. It shades even in the very fine M90 F nib. The only real drawback is the lack of waterproofness. On the other hand it seems like minor water accidents doesn’t ruin the text completely – if taken care of at once. The MB Racing green is written with a Conway Stewart medium italic and the Diamine Emerald with a Pelikan M600 with a wet extra fine nib. 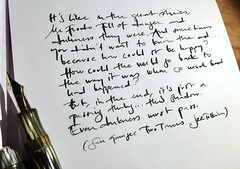 The paper used is Canson 1657 120 g paper which is a great paper for fountain pens – one of my favourites. As usual: Click on the photos to view them in full size. This entry was posted in canson, conway stewart, diamine, fountain pens, inks, j herbin, montblanc, paper, pelikan, pens, pilot, Pilot M90, reviews, writing, yard o led and tagged canson, conway stewart, diamine, fountain pens, ink, j herbin, montblanc, Pelikan, pens, photo, pilot, review, reviews, yard o led. Bookmark the permalink. and can’t wait to test drive and review that. I’m using Diamine Forest Green carts in my Carene. Nice, but not as deep and sumptuous as your Herbin. I really enjoy my Herbin inks. Poussière de Lune is one of my all time favourites. I also really like their Lie de The, and Lierre Sauvage (Wild Ivy). The Lierre Sauvage is a brigher green than Vert Empire in my opinion. Curious what you’re looking for in a green ink…. That is a very good question :). I am very picky when it comes to green – it is a colour that is very (in my view) dependent on setting and light. I have no good answer at the moment – I’ll think about it for a while.